Axeraider70 has created different sets of amazing photoshop brushes for us. It enables us creating some images with abstract style easily. All of the brushes are released under Creative Commons License 3.0. You can freely use them for non-commercial use. There is a Brush Download and Insertion Guide available too. Many sites offer browser compatibility charts, but few back up their compatibility claims with repeatable tests. Google believes strongly in the value of test cases and automated regression testing. All of the tests in Google Doctype can be run individually or in groups, using the JSUnit automated testing framework. This allows us to update our charts quickly and easily as new browser versions come out. It also allows you to test in your own browser to see exactly what the compatibility claims mean. Many sites offer developer resources for the open web, but few sites make those resources available under open licenses. You can read, but you can’t download. Or you can download, but you can’t redistribute. Google makes it easy to download the entire encyclopedia and take it with you, publish it on your private intranet, or package it for redistribution. 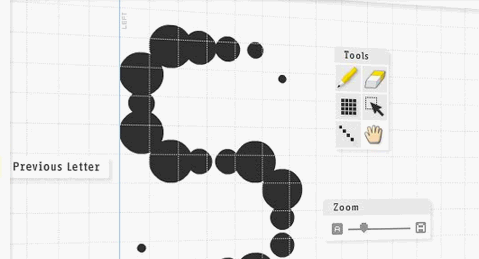 FontStruct is a free font-building tool brought to you by FontShop. FontStruct lets you quickly and easily create fonts constructed out of geometrical shapes, which are arranged in a grid pattern, like tiles or bricks. Once you’re done building, FontStruct generates high-quality TrueType fonts, ready to use in any Mac or Windows application. You can keep your creations to yourself, but we encourage users to share their “FontStructions”. Explore the Gallery of fonts made by other FontStruct users and download them or even copy them and make your own variations. Some of the fonts within the Gallery looks really good and professional. Have you created your own fonts yet? The zoom ratio will be increased and decreased if you click and drag upwards/downwards your mouse. The zoom window will be increased and decreased if you click and drag to the right/left your mouse as well. Have you found any open source image magnifier that you would like to share with us too? Smart Image Resizer allows us to resize and crop any image on our websites without touching the actual image or writing any code. We upload each image (JPEGs, GIFs, and PNGs) once at a high enough resolution and can then reuse it at any size we want, anywhere we want. It doesn’t matter if the images are in a post, on a page, or in a template file, it just works. All of the magic is done through the query string part of the URL in the src attribute of the img tag. You might have encountered interactive demos created with screencasting and screengrabbing software (e.g. Amberjack, Demofuse or Jing) that explain an interface to users in a step-by-step manner. This is exactly what this script does for web sites. When you loaded this page and all went well you’ll have seen the examples, download and first paragraph section being highlighted and a small panel with information showing up in succession. This is done with this script. Step by Step uses the Yahoo User Interface library, and pulls in most of its dependencies automatically. So, what you need to do is write a JSON object and either embed it in a script tag or link to it as an external file.